Best Home Furnishings, Green Home Furnishings, Fashion Home Furnishings: Air Pineapple (Tillandsia) – Plant Curtain, Have You Ever Seen? Air Pineapple (Tillandsia) – Plant Curtain, Have You Ever Seen? Have you ever seen such a beautiful curtain? Do you know the curtain is a living thing? It can grow, can blossom out. Most importantly, it can absorb bad airs such as form aldehyde, toluene, nicotine contained in the atmosphere, at the same time release oxygen, purify your living environment. Recently I hang a Tillandsia curtain in my living room, which has replaced the window screen curtain, and it is different with common curtains made of fabric, the tillandsia curtain bring me more closely feelings as well as tensions full of life, you will observe subtle changes occurred on it everyday and you breathing with it together. The curtain can produce overhanging impression just as a waterfall, bring cool air to the hot summer. . .It can not only block hot lights from the balcony, but also covers messy of clothes on the line in the balcony. 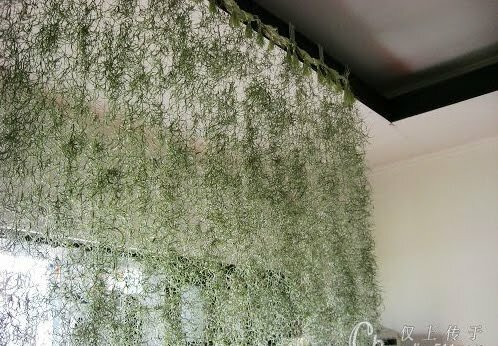 Tillandsia curtain can not only worked as a practical utility, it also can acted as a viewable artwork, and it is very suitable for a interior decoration. What this kind of plant is? 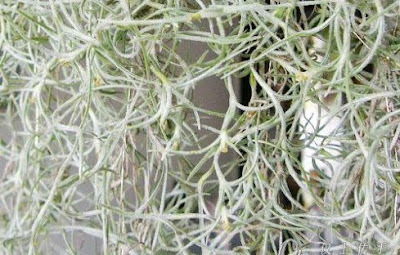 It is called tillandsia, also"Air Pineapple” in Chinese.The most welcomed advantages of tillandsia curtain is it do not need too diligent care, as long as there is air, it can grows very well, and in dry hot season, you only need to spray more water to it. Air pineapple has no roots, each stem you grow will survive easily, and it breathes depends on scales on leaves and has strong vitality. Air pineapple is very hardy in winter and can live with conditions of temperatures of 10 degrees below zero centigrade. Now you know air pineapple is really a type of votive plant and very suitable for growing by lazy people, it always pay out and never request. So, do you like the plant – air pineapple? 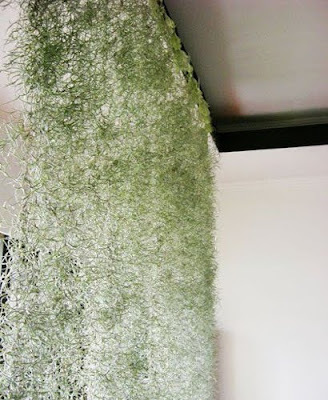 * Original post: Air Pineapple (Tillandsia) – Plant Curtain, Have You Ever Seen? Where can one find such a thing? Really nice!